The Jersey Pool Masters completed a round island relay piloted by Neil Faudemer on 'Corbiere Star'. The team consisted of Tom Gallichan, Dan Halksworth, , Simon Militis, JJ Gallichan, Phil Labey and Stefan McGreevy who together set a new record for the relay swim in a time of 8 hours 51 minutes. Club member Fay de Gruchy completed her Jersey to France swim in a time of 9 hours 35 minutes. Fay has spent the last 2 years recovering from a skiing accident and has been training hard throughout the year for this swim. Ed Shorrock, Tom O'Connor, Simon O'Donoghue, Garry Bell and Greg Woods successfully completed a Sark to Jersey relay swim in a time of 9 hours 43 minutes. This is a swim that hasn't been completed many times previously because of difficulties with tides. Congratulations to all swimmers. Max Beers successfully completed his Jersey to France swim, breaking the record Andy Truscott set in July. The new record now stands ar 6 hours 32 minutes. Congrautlations to both Aly Phippen and Amanda Bell on their round Jersey solo swims. Both swimmers set out from Elizabeth Castle breakwater and experienced some tough conditions. Aly was escorted by club boat 'Sea Swimmer 2' and Amanda was escorted by Matthew Clarke of 'Lionhearted'. A huge congratulations to Sally on her 2-way English Channel swim. Sally has been training for this swim for a number of years but the weather has always been against her. She finally got the call to go and started her swim from Samphire Hoe beach, England. She made her way to France and landed at Wissant in 15 hours 3 minutes where she has a 4 minute stop to re-apply grease before entering the water to start her return journey back to England. She swum through the day, night and another day before landing back in England after 36 hours and 26 minutes of swimming. Sally becomes the oldest person to have completed a 2-way English Channel swim and the second Channel Islander to do the swim. Andy Truscott, Robin Johnson and Decio Ferreira completed their 3-man relay around the island in a very respectable time of 10 hours 25 minutes. Team CAWS is a relay team of swimmers from the UK and completed their Round Jersey swim in a time of 10 hours 35 minutes. They were escorted by Matthew Clarke of Lionhearted. Laura successfully completed a Jersey to France swim in a time of 10 hours 51 minutes. Laura is a life member of the JLDSC, and pioneered the Jersey to France swim with Cliff Golding in a 2 man (Anglo-Spanglo) relay in 2005. Many congratulations to Laura and her crew, Mick Le Guilcher, Martin Powell, Nigel Trehiou, Chantelle Le Guilcher and Dee Richards. Congratulations to our President Wendy Trehiou, Vice President Dee Richards and Honorary Vice President Linda Devereux who were part of a 6 person relay across the channel. All swimmers in the relay team are cancer survivors and were swimming in memory of Sonia Sandham. Many biodegradable ribbons that had been written were released mid-channel with fresh lilies in memory of all those affected by cancer. A break in the weather saw two round Jersey swims on 6th August. Committee member Adrian Follain was accompanied by 'Sea Swimmer 2' with Mick Le Guilcher at the helm, Martin Powell, Chantelle Le Guilcher and Chantelle Rose. Adrian had a tough final stretch to the breakwater but finished in a time of 12 hours 5 minutes. Setting off at the same time was David Barra from the USA. David is a very experienced open water swimmer with a number of swims to his name. Many thanks to Simon O'Donoghue for the use of his boat 'Fish head' and also to Ian Barrette for piloting the swim. David was also accompanied by his wife Clare, Andy Truscott, Alice Harvey and Tasmin Powell. David touched the wall in a time of 10 hours 37 minutes. 01/08/2016 - SAVE THE DATE! 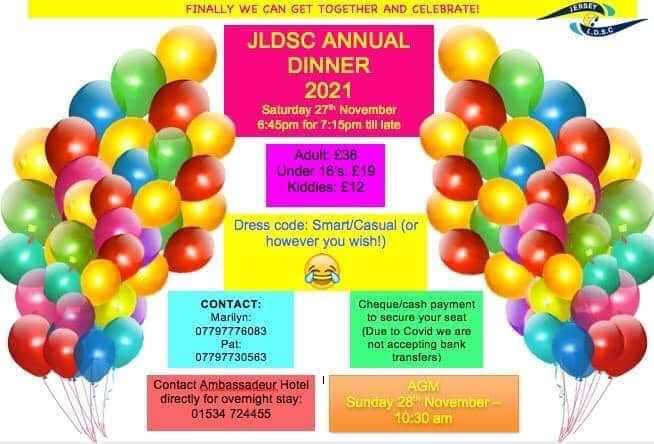 A gentle reminder from the diner ladies to save the date for the JLDSC Annual Dinner and Awards. The dinner will take place on 26th November with the AGM the following morning. Both will take place at the Ambassador Hotel. ​More details to follow in a few weeks. The club held the annual De Caux trophy swim on Sunday. There are two trophies available, one for the youngest female swimmer and one for the youngest male swimmer on the day. Our winners were Ocean Brown and Piers Willis. Not even two weeks since his Channel swim Andy Truscott completed a Jersey to France swim as part of his Arch to Arc Challenge. Andy ran 11 miles from People's Park in St Helier to St Catherine's, jumped in the water and swum to France (piloted by Matthew Clarke of Lionheart) and then cycled from Port Bail to the Arc de Triomphe in Paris. Andy completed the challenge as a race with fellow endurance athlete Paul Burrows in a time of 34 hours 31 minutes. He also broke the record for the Jersey to France swim in a time of 6 hours 37 minutes. There is no break for Andy as he has a few more swimming challenges this season! Sale completed a Round Jersey last year and became the first Austrian to do so. Not content with his Jersey achievement he returned this year to complete a Jersey to France swim. He completed the swim in a time of 7 hours 25 minutes and also became the first Austrian to complete this swim. Congratulations to Alice Harvey for completing a two way Windermere swim (21 miles) in a time of 12 hours 16 minutes. Alice completed a one way in 2013 and after finishing said "I don't know why anyone would do that two-way!" Alice also becomes the first person from Jersey to complete a two-way Windermere. Sally completed two round Jersey swims in 72 hours in the lead up to her double English Channel crossing later in the season. She completed the first swim on 22nd July in a time of 10 hours 36 minutes and completed the second circumnavigation of the island on 24th July in a time of 11 hours 10 minutes. Sally becomes the only lady to completed three round Jersey solo swims. Congratulations to all round island swim teams that took part in the Round the Island Challenge to raise money for the Grace Crocker Foundation. Many club members were involved and did their training and 2 hour qualifying swims with the JLDSC. We look forward to supporting the challenge again next year. Andy Truscott travelled to Dover with club President Wendy Trehiou and committee member Alice Harvey to attempt the English Channel. Andy was 'weathered out' last year but got the call from pilot Neil Streeter to say the weather was looking good. It was certainly worth the wait as Andy had perfect conditions. He started at 0955 from Samphire Hoe and made good progress into the shipping lanes and separation zone. Andy missed the Cap by a few hundred metres but dug deep til the end and landed under moonlight on a small sandy beach 'Point De La Courte Dune' in a time of 13 hours 57 minutes. Congratulations on a brilliant swim Andy. St Brelade Constable Steve Pallett set off from La Coupe piloted by Neil Faudemer. he landed south of Port Bail in a great time of 9 hours 37 minutes. Chantelle Rose was on board as JLDSC observer. Well done Steve on a fantastic swim. Juliette Bigley, another visiting swimmer from the UK set off from La Coupe in the early hours and swum in darkness for the majority of her swim. She had flat calm conditions and completed her swim in a time of 7 hours 16 minutes. Kevin Welsh, a visiting swimmer from the UK took to the water at La Coupe at 0913 and landed at St, Germain in France in 8 hours 44 minutes. Congratulation Kevin on a brilliant swim. Team Together, a 5 person relay consisting of Dee Richards, Linda Breen, Lisa Biddlecombe, Linda Devereux and Karen Gallichan completed their round Jersey relay in a time of 11 hours 43 minutes. Sadly their sixth member Rachel Harker was ill at the time of the swim and was unable to take part. Just means they will have to do the swim again next year as a full team! The club swim on 17th July at St Catherine's will be the "Robert McLaughlin swim" in memory of founder member Jean McLaughlin's husband. Robert played a huge role in helping with the boats in the early days of the JLDSC. ​Time and location will remain the same. Congratulations to Jo Pullman for completing a one way Windermere swim (10.5 miles) in a time of 5 hours 38 minutes. Fantastic achievement Jo, well done. Well done to club members and life long swimmers Andy Truscott and Ali Wood (nee Horsefall) who completed a two person relay from the Minquiers to Jersey, a never been done before swim, in a time of 6 hours 23 minutes. They were piloted by Matthew Clarke on Lionhearted with Rhianna Reynolds as JLDSC observers. Ali's dad Derek was also onboard to provide support. Huge congratulations to former president Sally Minty - Gravett for being awarded an MBE for her services to swimming over the years. Sally has been swimming since the age of 3 and was taught to swim by her dad, Leslie Minty, a founder member of the club. She has gone on to teach thousands of children and adults to swim and introduced many people, young and old to the club. A very deserved award and the JLDSC are very proud of Sally's achievements. Tuesday night swimming has now moved to open water. We will be based at Havre des Pas for the next 6 weeks (until schools break up). We are aiming to get in the water by 6.30pm at the latest so please arrive promptly. Parking can be an issue so allow yourself plenty of time. 31/03/2016 - Its been a successful month for JLDSC swimmers! Congratulations to 2 members who have recently completed sea swims overseas. On 27th March Sally Minty-Gravett was due to swim the cross Channel from Nevis to St. Kitts in the Caribbean. However due to adverse winds the swim was altered for safety reasons. Despite a water temperature of about 26 C (!) Sally finished first in her age-group and has won a fabulous hand carved turtle trophy! On 28th March, Eric Blakeley swam across the Straits of Gibraltar and is believed to be the first islander to achieve this. Approx 12 nautical miles and in windy conditions, it took Eric 6 hr 51 mins. An amazing achievement! This is just to remind you that Tuesday night swimming resumes on Tuesday 12th April. 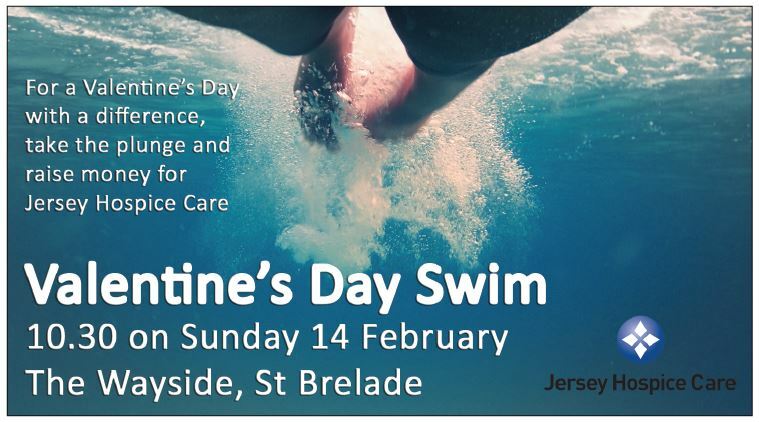 We are in the process of finalising the summer sea programme and will send it out when completed however the first swim will take place at St Catherine's on Monday 2nd May at 11am.